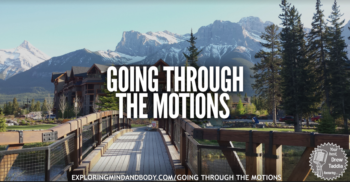 Join Drew Taddia, host of Exploring Mind and Body this Tuesday afternoon at 3pm on Radio Laurier, as he talks about Going Through the Motions. On this edition of Exploring Mind and Body Drew Taddia will be talking about the benefits of going full tilt and avoiding going through the motions. What he has found when he has put in all of the effort he could possibly muster and the odd time when he didn’t. Let’s talk about the old saying, ‘if you’re going to do, do it well or not at all’.